Making excuses is pointless right now, am I correct? Shame on me for being neglectful, etc, etc. It has been unbelievably crazy, guys, and I have so much to tell you! I am mastering flys in pants and fancy hand-stitched hems and having lectures from technical designers from Target and giving speeches (and failing at it) and re-evaluating and it's been fantastic and utter madness. I've been realizing a lot of things lately, and also questioning a lot of things. I don't know. My head is so full of thoughts and life has been going by too quickly to sit and breathe. All I'm trying to do is make it through the semester in one piece with decent grades. Everything else is a bonus. Please, forgive me if this post is all over the place; and if it is, then it mirrors my life perfectly. First off, how was your Halloween weekend? What did you dress up as? Where did you go and what did you do? I went with a group of friends to Madison. 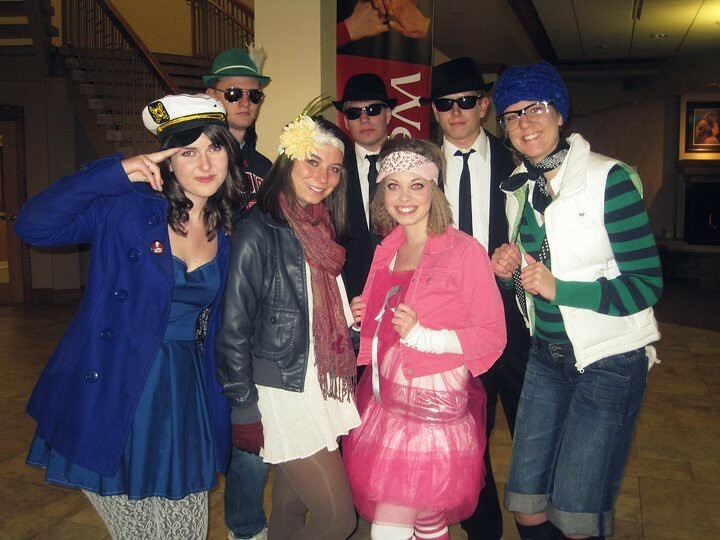 We stayed at one girl's house and went to the Badgers hockey game on Friday--not very Halloween of us, but still awesome--and then Saturday we went to Freakfest, ran into a lot of crazy people in crazy costumes, and saw Little Big Town play. It was such a blast, and people watching was the best part. I made myself a costume, of course! 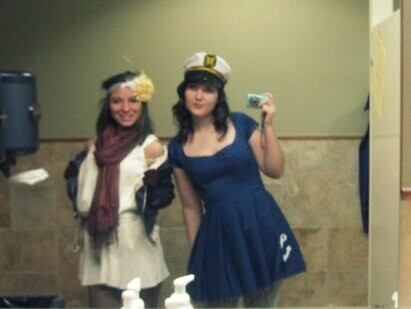 I sewed up a little sailor girl dress on Thursday night and borrowed a hat from a friend. I wore it with some shoes I bought for Urban Outfitters earlier that day (for $5! I've never been in the store before and their sale section was unbelievable! ), a few layers of tights (it was cold! ), and my peacoat. Unfortunately, we didn't get awesome photos, but these work. Good ol' bathroom mirror shots! After Little Big Town (and almost being crushed/knocked over in the packed crowd) we went home at about 1AM and popped a movie in and didn't go to sleep until 4. It was a good night, in other words! But of course, after the fun, one must buckle down and get back to work. We've been working on a group presentation on design elements in my Intro to Apparel Design class. My group specifically is working on Coats, Jackets, and Blazers. Basically, we put together a powerpoint presentation on our topic, talking about the design and history of them. It's a little tedious, to tell you the truth! But in Apparel Construction, we're making pants, which is actually super fun. I'm making navy blue slacks that come up past my belly button, haha. They're due next Thursday and coming along swimmingly: I finished the fly today (went in smoothly, for the most part -- thank goodness! ), and I get to really start putting them together now that I've had my final fitting. I'll take pictures for you, okay? I love that class so much, because it's exactly what I want to be learning. Besides that, I've been working away in my other classes and getting really excited to be home for Thanksgiving. I can't believe it's even time to get excited about Thanksgiving! Things have gone by so quickly. Have two months really passed? Crazy business. I know what you mean about college being busy! I'm half way through my first semester at university (I'm English!) and there's so much going on I have no time to stop and think about it. I'm having an incredible time, but everything moves so fast! I love love love your hallowe'en costume, it's so pretty. I dressed up as Magenta from the Rocky Horror Picture Show, although I didn't make an outfit (I just wore a black dress) I did spend ages on my makeup and hair! It's so good to hear from you again. I understand how the time can get away from you--especially during college. I didn't dress as anything in particular for Halloween...I just wore a funkier-than-usual outfit: magenta tights, black tulle skirt, black high-heeled boots, a lacy white blouse, and a grey halter-style vest (that I made). College sounds exciting, Addie! 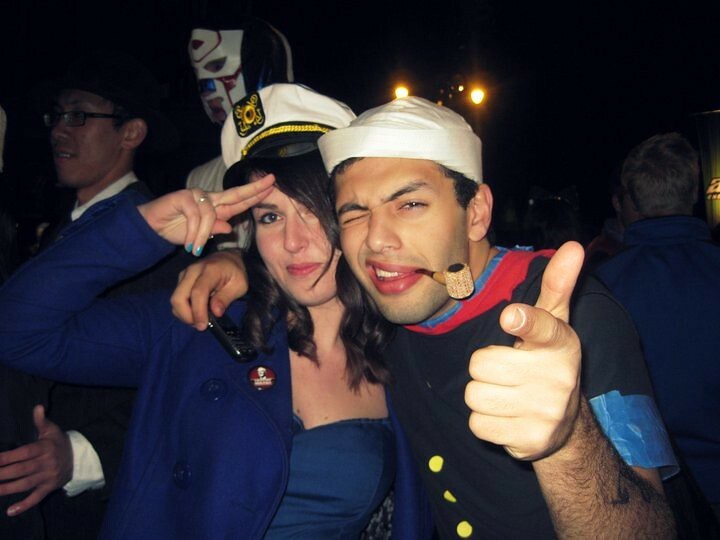 Your costume is super cute and I love that you took a picture with Popeye. haha. I've missed reading your posts, but I know EXACTLY how you feel. College is busy. I haven't sewn anything in forEVER and I really want to. Homework takes up so much time... Christmas break will be wonderful. I dressed up as a pirate for a Halloween party. Pretty much just so I could wear my pirate hat with the big feathers that I made a few months ago. It kept knocking people in the face though so I had to take it off after a while. Haha! Your classes sound like SO MUCH FUN! I can't wait to be taking courses like that. Hey! It's Addison in Madison! Finally! I was just about to post a "we miss you" comment. Life sounds completely lovely and exciting over there!! What I did for halloween? Well I didn't do much, but I was Betty Boop myself (and ever since I'm falling back in love with pin up). Had a lovely reunion with mates and drank the cheepest beer ever. wooow your dress is amazing...kisses!! I love love LOVE your costume, you always make the cutest thing. I have to agree about UO's sale section, too good! I got an adorable nautical playsuit there. 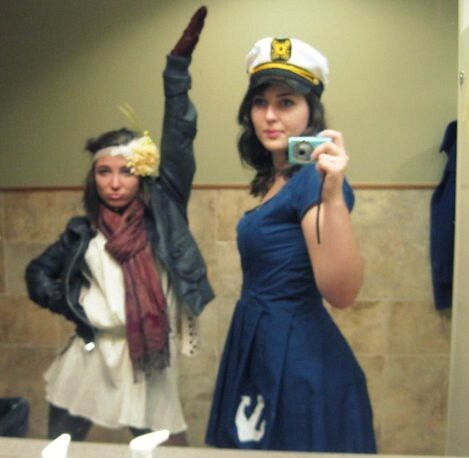 I was dressed up as captain hook for halloween, nautical costumes for the win! (Also, I found Louise Ebel's EXACT red coat. Thrift stores are the best thing on the planet). Also, when you get here, you will ADORE London, it's amazing! I hope all of your homework and craziness and the like go well.